I have had a few relatives die or suffer from diabetes. My dad’s mom's two sisters – only an African would say that eh…… Anyway, two of my grandmothers' sisters died of diabetes related complications. However, they were all at least 70 years old by the time they passed on. My dad’s brother also suffers from diabetes which because it was detected early, he was able to control before it got out of hand. • Eye disease and blindness. Control your blood glucose and blood pressure and get a dilated eye exam once a year. • Heart health. To protect your heart and blood vessels, eat right, increase your activity, don’t smoke, and keep healthy blood glucose, blood pressure, and cholesterol levels. Eat a healthy diet that is low in salt and high in non-starchy vegetables. Work with a dietitian to plan healthy meals. If you’re overweight, talk about how to safely lose weight. Ask about a physical activity (or exercise) program. Quit smoking if you currently do. Get a hemoglobin A1C test at least twice a year to determine what your average blood glucose level was for the past 2 to 3 months. Get your blood pressure checked at every doctor’s visit (or at least once a year). Get your cholesterol checked at least once a year. Take medications if prescribed by your doctor. • Kidney disease. Control blood glucose and blood pressure. See your doctor if your urine is cloudy or bloody, if you feel like you have to urinate often, if you have pain or burning when you urinate, or if you have back pain, chills, and fever. Have a urine test once a year. • Foot problems. Check your feet every day for cuts, sores, bumps, blisters, or red spots. Wash your feet daily and dry them carefully. Ask your doctor to check your feet at every office visit. Have a complete foot exam four times a year. • Mouth problems. Twice a year, have a dentist clean your teeth and check your gums. Use dental floss at least once a day. Brush your teeth with a soft toothbrush after every meal. • Nerve damage. You can help keep your nervous system healthy by keeping your blood glucose as close to normal as possible, getting regular physical activity, not smoking, taking good care of your feet each day, having your doctor or nurse examine your feet at least four times a year, and getting your feet tested for nerve damage at least once a year. • Flu and pneumonia. Get a flu vaccine every year. Ask your doctor about getting a vaccine to protect you from pneumonia. Being sick can raise your blood glucose. 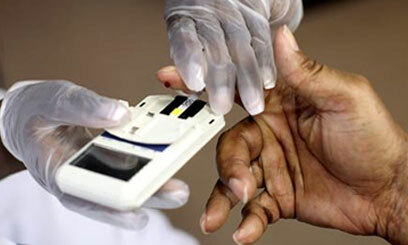 Moreover, illness can stop you from eating properly, which further affects blood glucose. Watch your blood glucose carefully if you are sick with the flu or a cold.